Phillipines – Pasig Real Estate Board, Inc.
Pasig Real Estate Board, Inc.
Sa PRB, at home ka dito! The PAREB – Pasig Real Estate Board, Inc. (PRB) is conducting its last review today for the Real Estate Brokers Licensure Examination scheduled on Sunday, March 27, 2011. 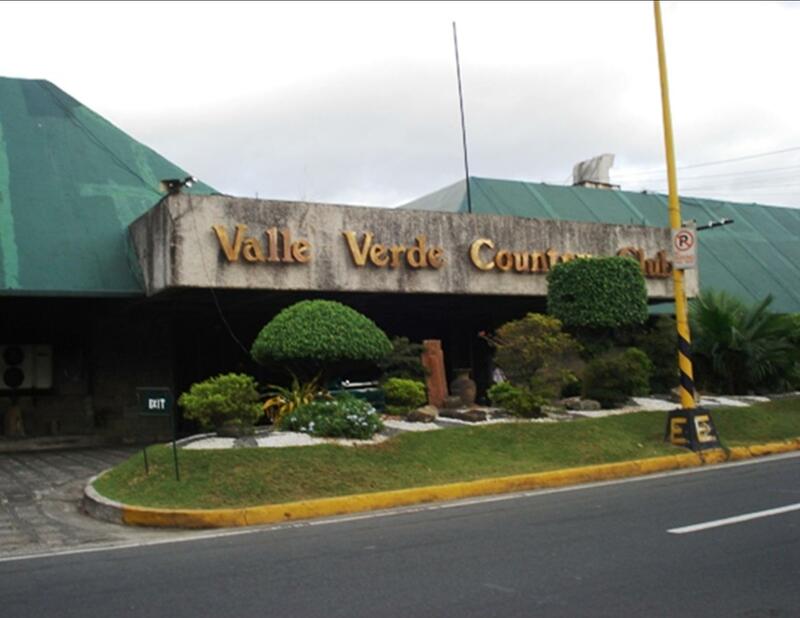 The venue for the review is at the Valle Verde Country Club (click here for map). It will be held from 8:30 am to 5:30 pm. with Atty. Ariel Martinez giving the review. The schedule and the coverage for the exams can be found in this website: Real Estate and Seminar Review. Examinees are reminded to be at the examination venue way ahead before the published time to consider the length of time to get a parking (for those with cars) and to avoid the long lines during the filling up of forms. Remember there will be thousands of other examinees taking up the broker’s licensure examinations with you. 1. Be sure to take something before you go. By the time you will have your merienda, more than four hours would have passed. 2. There is nothing like preparedness to avoid the panic and the rush during that day. Please study well and take a rest before the exams. 3. Avoid cramming, so if you have difficulty reviewing yourself, take the review. When you have done everything, there’s nothing you can do anymore but commit the results to the almighty (if you believe in one). Acceptance in His design and purpose in your life will definitely calm your nerves and give you an undivided focus during exam day. So please do not worry at all, a lot of people will also be praying for you. Good luck and may God bless you! The Pasig Real Estate Board, Inc. (PRB) General Membership Meeting will be held on March 22 instead of March 24 to give way to the review classes that will be held on that day. 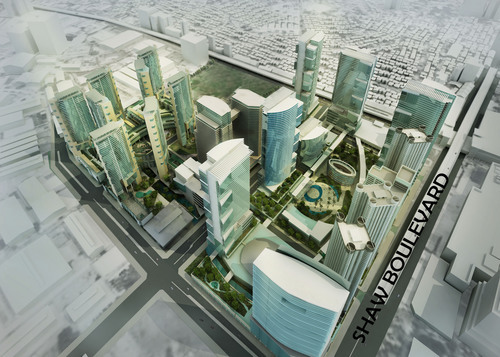 The GMM will be sponsored by Greenfield Development Corporation, a 50 year-old landholding company owning more than 11-hectares of prime commercial property in Mandaluyong. The meeting will be held at Greenfield’s Twin Oaks Showroom in Greenfield District just across Soho Central. 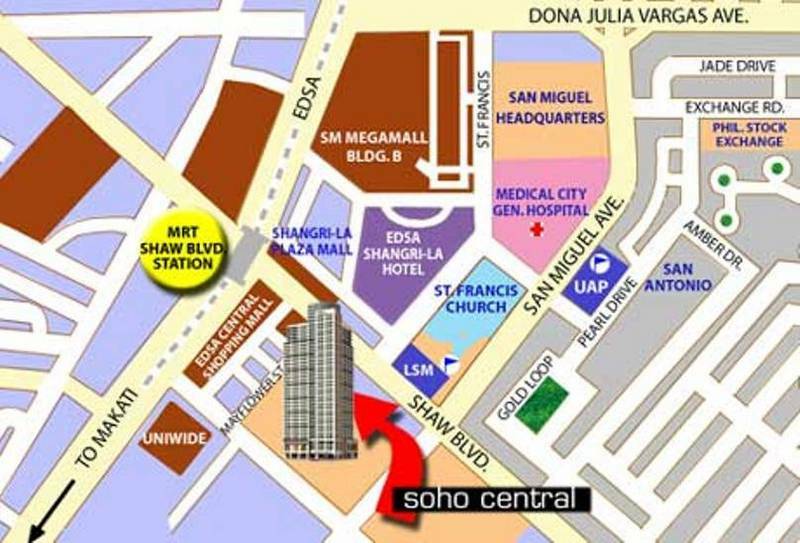 There will be free parking at the Soho Central. For those not familiar with the development, this is in the area of what used to be known as Edsa Central. If you want to see what Greenfields development can give our brokers and buyers, come to the meeting. There will be updates on other activities of the board. The meeting will start promptly at 5:00 pm., so PRB members please come on time. There’s a breakfast meeting among businessmen and professionals in the Ortigas Center area where they talk not only about their businesses and profession but also about God’s “businesses” in their lives. I’m refering to the breakfast meeting of the Brotherhood of Christian Businessmen and Professionals (BCBP) held at Racks in El Pueblo Complex, ADB Avenue corner Julia Vargas Avenue, Pasig City, Metro Manila every Saturday from 8:00 to 9:30 am. They have been inviting fellow businessmen and professionals for breakfast (for two years now in the venue) and a lot have been “refreshed” and enlightened by the sharing of the group members. Many business owners, some CEOs of companies and other professionals have been attending so if you have the chance to go to this breakfast, you wouldn’t want to miss what they are getting aside from the good food in Racks. The first breakfast is free courtesy of your sponsor, but even without a sponsor you can walk in and introduce yourself as a businessman or professional. So if you are in Pasig and is looking for more meaning in your life, I am inviting you to the men’s breakfast. For couples, you may come for the joint breakfast every last Saturday of the month. There are also similar breakfasts in more than 100 venues all over the Philippines. Even if you’re not from Pasig you can go to one, in fact there’s one in Club Filipino Greenhills every Thursday from 7:30 to 9:00 am. The Greenhills group have been doing this for more than 25 years now. Anyone who is interested may call me at 0918 923 4955 or 782 6034 . 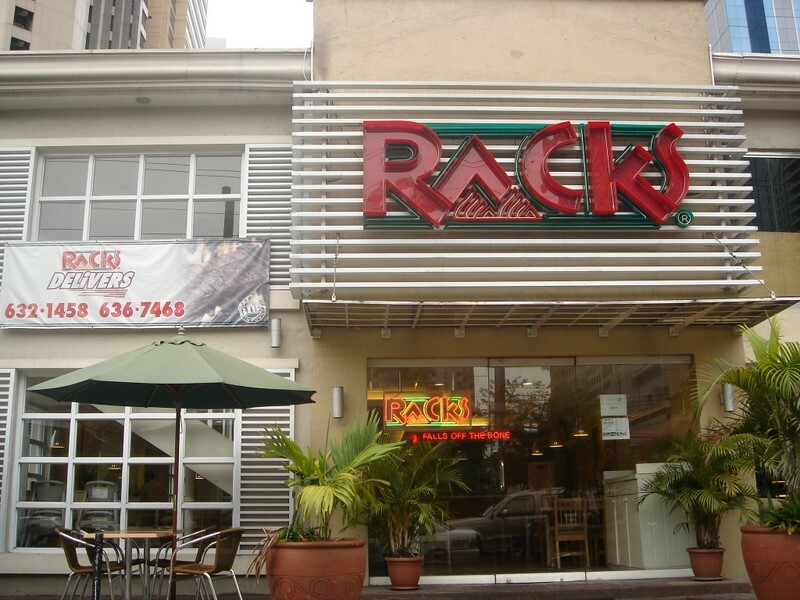 We can meet up at Rack’s Pasig on a Saturday morning, or at Club Filipino if you want to come on a Thursday. My friends, I hope to see you one of these days. Come and have breakfast with us! There’s a place in Makati where you will look wonderful after a few rounds of tapas and wine. The place is called Charlie’s Bar in Malugay. Some Pasig Realtors Board (PRB) members checked out the place after finishing the Comprehensive Real Estate Seminar and Review (CRESAR) they were doing. The members who went there (Atty. Abet Sales, Mau Garin-Garcia, Jenny Acosta, Ket Santos, Leng Reyes, and others) were surprised to find out the wonderful singing talent of fellow member Stan Liberato who sang Eric Clapton’s “Wonderful Tonight”. 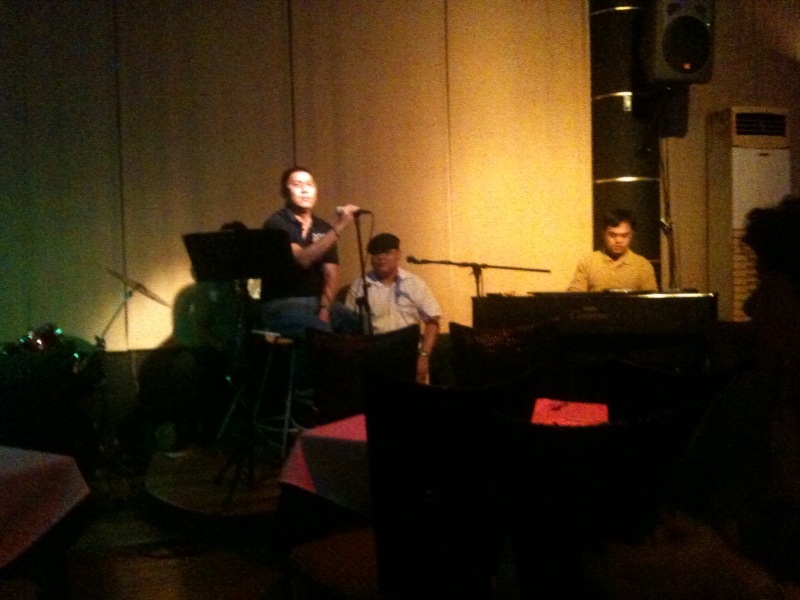 Charlie’s music and wine jazz bar is co-owned by fellow member Robert and Jenny Acosta and is located at 7232 Malugay St., Bel Air, Makati (inside Makati Golf Club). Their telephone numbers are +632 840 5745 or +632 830 2222; they are open from Monday to Saturday, 11 am to 2 pm and 5:30 pm to 12:30 am. If you want to give something to charity here’s a chance to be generous while enjoying a musical concert. 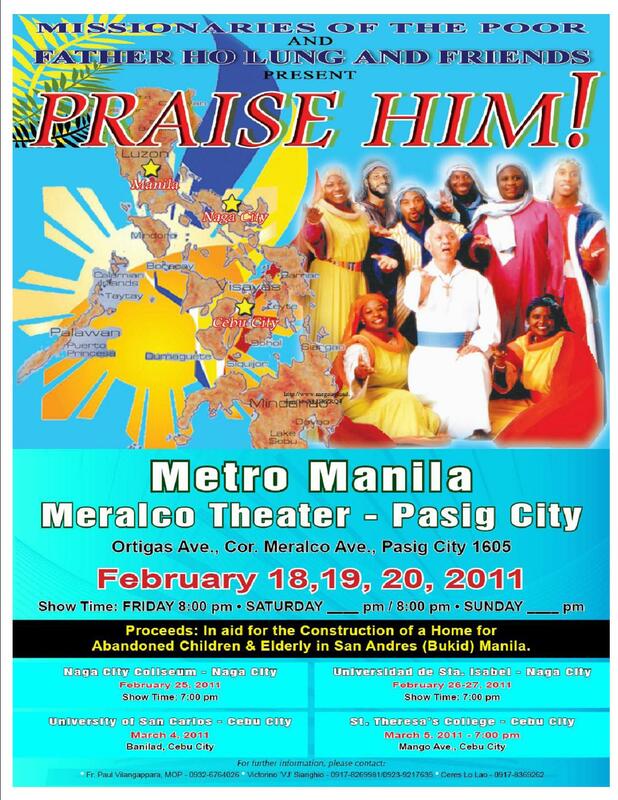 There’s a fund raising event in Pasig City this February 18, 19 and 20 to be held at the Meralco Theater. Greetings of Peace! The Missionaries of the Poor (MOP), a religious congregation of priests and brothers was founded in 1981 in Kingston, Jamaica by Fr. Richard Ho Lung. Since then, the MOP has grown rapidly and has spread to serve the poorest of the poor in Haiti, India, Kenya, Uganda and the Philippines. I served as the Superior of the MOP in the Philippines for 7 years, in 1995-1999 and as a priest in 2003-2006. Enclosed, please find a historical overview of our two mission sites in the Philippines, located in Naga and Cebu. I am writing to humbly ask for your help and support in our upcoming fund-raising event on February 18, 19 and 20 at the Meralco Theater. “Praise Him” is a very lively and colorful musical concert that will feature highly talented singers and actors from Jamaica including Fr. Richard Ho Lung, our founder. The details of the show can be found in the enclosed flyer. Proceeds of the concert will be used towards the building of apostolate homes and school buildings in San Andres Bukid, Manila for the destitute and abandoned children and adults with physical and mental disabilities. The construction of the apostolate home for 120 disabled children and elderly costs us around 15 million pesos. 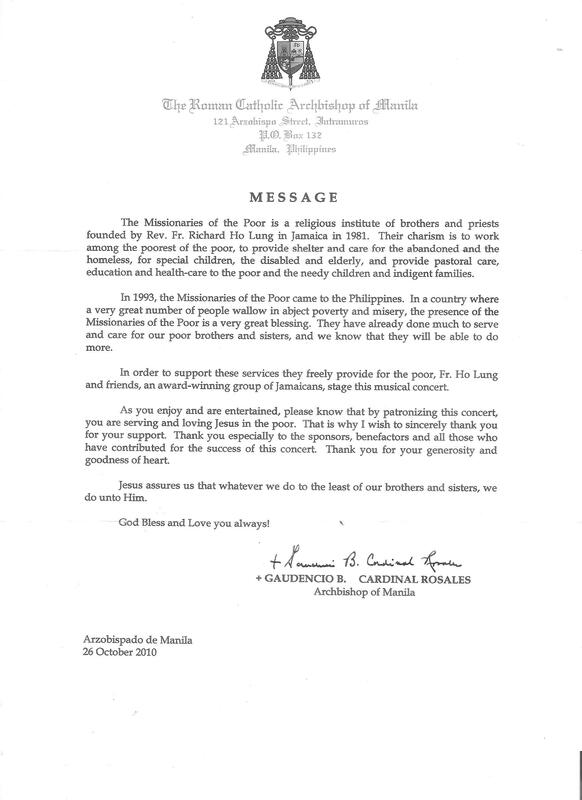 Cardinal Rosales has invited us to do this work and has given us 3000sq. meters property for this project. The MOP is entirely dependent on God’s Providence to fulfill its mission to serve the poor. Indeed, Our Good Lord has tremendously blessed our efforts to build God’s kingdom on earth as evidenced by the continued growth and expansion of our mission work in different parts of the world. We gladly invite you to be an integral part of our ministry to the poor and we kindly appeal to your generous hearts to help us make this building project a reality. Sharing your blessings with the least of our brothers and sisters is a powerful way of evangelizing the Good News of the Gospel in a concrete way. Please consider supporting the construction of the Apostolate building by becoming a Sponsor AD to the OUR MOP PROJECT in San Andres Bukid. Thank you in advance for your generosity. We pray for abundant blessings upon you and your family. Viridian is defined as a durable bluish-green pigment coming from the Latin word “viridis”, meaning green. In the english language, it is the more elegant name for the word green. In popular culture, it is used to describe the green design movement. In the Philippines, it is the name of the newest project to be launched by Ortigas and Company, the developer who built Greenhills. The Viridian at Greenhills is handled by the following lead brokers group: GH Heritage Group, the Prime & Green, and the Castle Group. The Castle Group is organized with some prominent Pasig Realtors as accredited brokers. To join, you may contact Toto Acosta or give your email address in the comments section of this post. For investors, avail of the investment price now as it’s expected to go up once the project is formally launched! Click here for more details: Viridian at Greenhills. The Pasig REALTORS Board (PRB) Comprehensive Real Estate Seminar and Review (CRESAR) has started with 170 participants attending. The venue is at One Cafe & Events Place, 6th Floor One Corporate Center, Dona Julia Vargas Avenue Corner Meralco Avenue, Ortigas Center, Pasig City. The CRESAR will be held on the following dates: January 17, 19, 21, 24, 26, February 2, and 4, 2011 from 8:00 a.m. to 6:00 p.m.
To those attending the seminar, may you achieve your dream of becoming licensed brokers. You have the advantage of being taught by Atty. Ariel Martinez, one of the most sought after speaker of today. Prepare well and good luck! Inspired by the words of PNoy (Philippine President Noynoy Aquino) ‘Kayo ang boss ko’, the 2011 Board of Trustees of the Pasig REALTORS Board (PRB) is raring to serve the members for this year. Their strategy for 2011 would be spelled out in the coming General Membership Meeting (GMM) on Jan 27, 2011. Not elected but automatically part of the board of trustees as Ex-Officio member is Manny Florendo, our Immediate Past President (IPP). What is special for Pasig REALTORS Board this year is the celebration of its 20th Anniversary. We’re kicking off 2011 with the launching of our blogsite that will coordinate our efforts in celebrating PRB’s 20th year. To all PRB members, be there on January 27. The first GMM is the most important membership meeting of the year. New Year in the Philippines is celebrated with fireworks in the streets. Although regulated, almost everyone still had access to firecrackers making the celebration of welcoming the new year dangerously exciting. This video shows the end of 2010 and the beginning of 2011 from the balcony of my house. May you have a blessed and prosperous 2011. 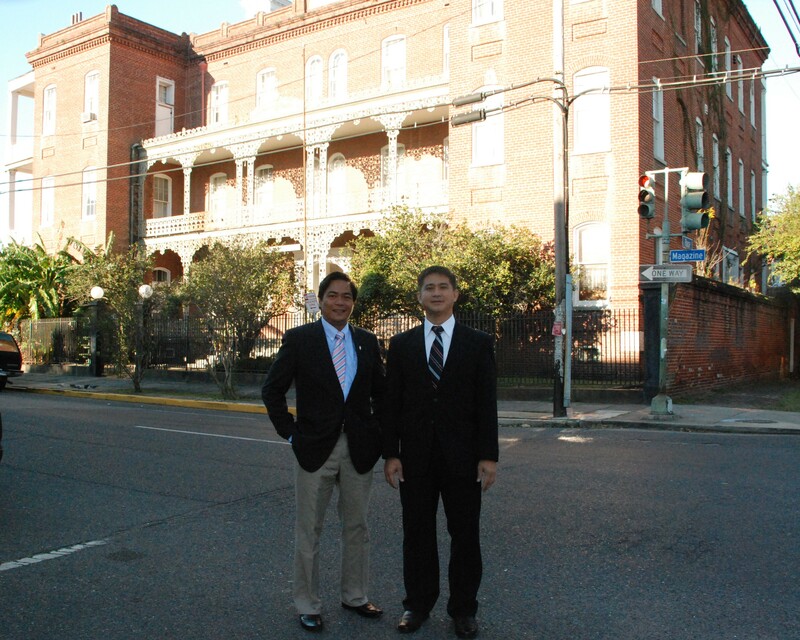 The Philippine Association of REALTORS Board (PAREB) members who attended the National Association of REALTORS (NAR) convention in New Orleans’ Morial Convention Center from November 5 to 8, 2010 experienced a lot of adventures. The group was headed by PAREB 2010 President Manny Bocaling and was joined by ten other REALTORS namely: Melinda Lit, Nympha Bocaling, Hubert Claveria, Paz Bentulan, Daniel dela Cruz, Mae Ponce de Leon, Abet Cuevas, Cherry Chrisostomo, Anton Bocaling, and myself, Nick Pongos. 1. Dining at Antoine’s Restaurant – this was suggested by Paz Bentulan, whose American husband Scott listed the must-visit places in New Orleans. Antoine’s is one of its oldest (1840) and most famous restaurant. I enjoyed tremendously the company, the charm, the history, and the splendid French-Creole cuisine. 2. Staying at an old haunted hostel – since I booked late, the only available accomodation near the convention site was a former children’s orphanage built in 1861, the St. Vincent’s Guesthouse. On my second night, Hubert Claveria joined me and occupied the extra double bed. The next day, he claims somebody joined us too. Scary. 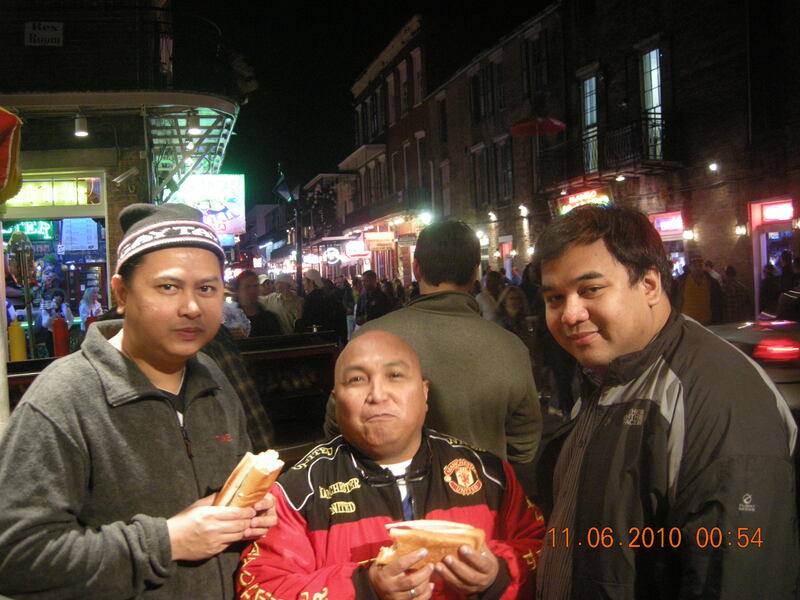 Eating hotdogs along Bourbon St.
3. Going to Bourbon Street at night – you have not been to New Orleans if you have not experienced the revelry in the famous French Quarter. This is the place where the annual Mardigras celebration is held and the street is regularly blocked off on weekend nights. There is a rule that bottles or glasses are prohibited on the street (you have to use open plastic cups). With all the drinking, there is usually a lot of things that happens into the night. You may have to invite any of us in facebook if you want to see more of our photos. 4. 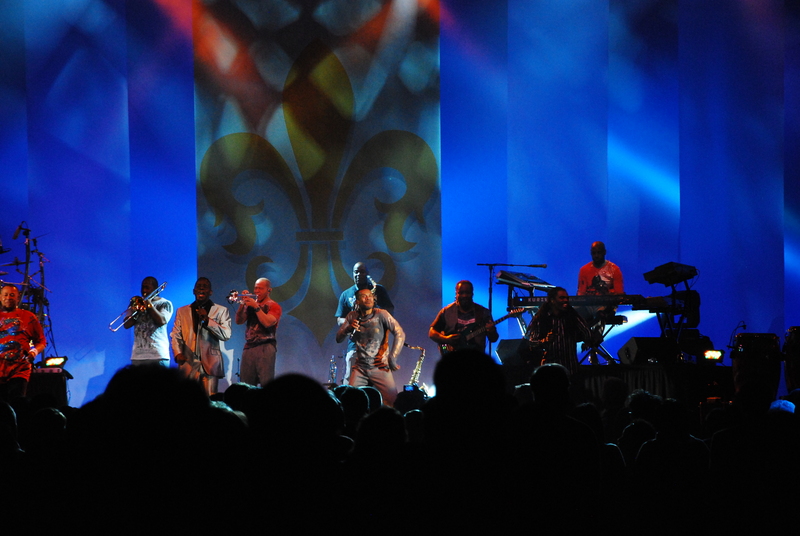 Listening to Earth, Wind, and Fire – one of my favourite bands. The delegates enjoyed watching them live in concert on the last night of the convention. It was fun seeing many local and international REALTORS sing and dance together. On our last day, we went to see District 9, the place severely affected from the floods spawned by hurricane Katrina. After seeing the damaged and abandoned houses, I conclude that there were indeed ghosts in New Orleans (there are a lot of ghost tours available). I don’t know if you would ever believe me, but it is highly recommended that you join in the next NAR annual convention in Anaheim to experience a different kind of adventure. Have a fun-filled new year!